Recently, Information Technology Solutions was asked to present the findings of the technology assessment to the Centralia Elementary School District Board. 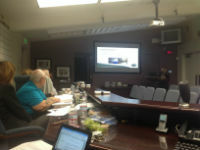 Denice Huntington, Executive Assistant/Project Coordinator (shown) provided the overview and fiscal information. The board members were very impressed with the assessment and the presentation and asked many questions of her and Mr. Michael Roark, VP of Technical Operations.